While this isn’t a food blog, I will share the basic riceball recipe. Several sites out there have it very, very wrong. Riceballs, or onigiri, are a traditional comfort food. They are used as a kind of “walking food” or something you take along with you to work, or into the fields, and eat as you work. In my youth, we used to pack it into our bags and sneak them into Disneyland, so we wouldn’t have to eat the expensive, and mediocre, Disneyland food. It was a comfort food for picnics. The onigiri, also called a musubi, is less of a walking food today, as it’s widely available at convenience stores. The most common form used to be a ball of rice stuffed with a single umeboshi (pickled ume apricot), and wrapped with nori (seaweed aka laver paper). I think things have changed, and a triangle is more common, and umeboshi shares the spotlight with other fillings, like tuna mayo, katsuobushi (shaved bonito), and salted salmon. In Hawaii, they pioneered the use of Spam on a rice loaf, which is known as “Spam musubi”, and was enjoyed by President Barack Obama, introducing the country to the Hawaiian savory lunch favorite. Making onigiri is simple. You need only four ingredients: warm-to-hot Japanese rice (or calrose rice in the US), a sheet of nori, one umeboshi (or other filling), and a bowl of salt water. Please note that there’s no vinegar, and no soy sauce. This isn’t sushi. An analogy: Sushi : Onigiri :: Steak Dinner : Cheesesteak Sandwich. So back to cooking. Wash your hands, and then coat your palms and fingers with the salt water. Take a half cup to a cup of rice, and put it into your palm, and then using your hands, form a ball. Be careful to let the rice cool so you don’t burn your hands. The first time, it’ll hurt, but, over time, you will get used to the pain of hot rice. Using your thumb, punch a hole into the rice, right into the center of the sphere. Shove an umeboshi into there. 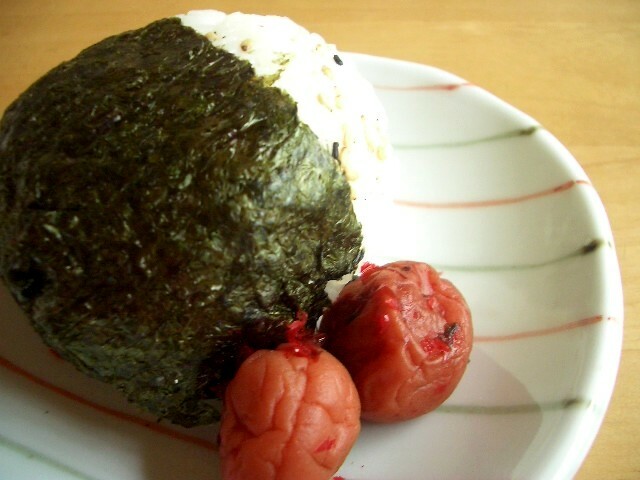 If the umeboshi is too big, you can use half. Close up the hole, and then wrap the ball in nori. You can press the nori onto the rice, to make it stick. The steam will soften the nori, and help it adhere. Onigiri with umeboshi will last nearly one day without refrigeration. The umeboshi is like a preservative. I suspect it might be the toxic pit emits some chemicals that stunt or slow bacterial growth. The pit contains a little bit of cyanide, or a chemical that becomes cyanide in the body. I know people think that ume is a health food, and perhaps it is, but the pits are toxic, so don’t try to shell them and eat the nut. Now, try to ignore the pain in your hands, and be careful not to swallow the ume pits, and enjoy your rice ball. It’s national rice ball day!